Erie scored five goals before Sarnia finally found the back of the net midway through the second period. Alex DeBrincat (2g 1a), Brett Neumann (1g 2a), Taylor Raddysh (1g 1a), Darren Raddysh (2a) and Allan McShane (2a) led the way offensively for the Otters. Both Sarnia goals were scored by defenseman, with Jeff King and Jordan Ernst scoring. Troy Timpano stopped 30 of 32 shots while Justin Fazio was pulled after allowed five goals on 12 shots. With the IceDogs hosting Pride Night, Jordan Kyrou (1g 3a), Nikita Korostelev, Franco Sproviero (1st OHL goal), Anthony Salinitri, Troy Lajeunesse and Jeff King scored for Sarnia, while Oliver Castleman 1st OHL goal), Ryan Mantha, Graham Knott (1g 1a) and Akil Thomas (1g 1a) scored for Niagara. Hamilton scored five first period goals, and added two more in the second. Niki Petti (1g 2a), Matt Luff (1g 2a), Will Bitten (1g 1a) and Benjamin Gleason (2a) had multi point nights in the win, while Cam Dineen (2g) and Brett McKenzie (1g 2a) led the way for the Battalion. Kaden fulcher stopped 32 of 36 shots while Mat Woroniuk was pulled after allowing four goals on seven shots. Boris Katchouk tied the game with 1:30 remaining to force overtime. In the five round shootout, Gustav Bouramman and Otto Makinen scored for the ‘Hounds, while Steven Lorentz scored the Petes only goal. The Spits scored four first period goals and finished the night with three power play markers. Jeremiah Addison (1g 1a), Gabriel Vilardi (2a), Logan Brown (3g), Julius Nattinen (2a), Jalen Chatfield (1g 2a) and Aaron Luchuk (1g 2a) had multi point nights in the win. Ryan Moore (1g 1a) and Kole Sherwood scored for Flint. Michael McNiven stopped all 32 shots he faced in the Attack net. Zachary Roberts, Maksim Sushko (2g), Petrus Palmu and Nick Suzuki (1g 1a) scored for Owen Sound, while Ethan Szypula chipped in with a pair of helpers. Flint scored the first five goals of the hockey game until Mississauga responded with one in the second period and three in the third. Alex Peters (3a), Everett Clark (1g 2a) and Luke Kirwan (2g 1a) led the Firebirds offence. Owen Tippett (2g) and Michael McLeod (3a) and big offensive nights in the loss. Zachary Senyshyn scored three goals and David Miller added a single for the Soo. Linus Nyman scored Kingston’s only goal. Mattew Villalta stopped 27 of 28 to record the win, Jeremy Helvig stopped 27 of 30 in the loss. Dmitry Sokolov (3g 1a) had a big offensive night as the Wolves exploded for five goals in the game’s first half, leading the bulldogs 5-1 through the midway point of the second period. Isaac Nurse, Matthew Strome and Trent Fox scored for Hamilton to make it a one goal game before Michael Pezzetta added an insurance marker into the empty net. Anthony Salinitri (1g 1a), Jordan Ernst (1g 1a), Ryan McGregor, Jaden Lindo and Nikita Korostelev scored for Sarnia. It was Korostelev’s sixth goal in his last five games, he’s totaled 10 through eight games. Jason Willms and Cordell James scored for Barrie. Justin Fazio stopped 28 of 30 shots in the Sarnia net. Taylor Raddysh and Kyle Maksimovich scored third period goals as Erie erased a two goal deficit to force overtime. In the four round shootout, Erie’s Ivan Lodnia is the only player to find the back of the net. Nate Schnarr, Albert Michnac and Givani Smith (1g 1a) scored for Guelph. Both goalies, Guelph’s Liam Herbst and Erie’s Jake Lawr, stopped 34 of 37 shots respectively. Kitchener scored three second period goals, and added three more in the third. The Rangers were led offensively by Greg Meireles (2g 2a), Jeremy Bracco (1g 2a) and Adam Mascherin (og 2a). Mitchell Stephens (1g 1a) and Tye Felhaver scored for Saginaw. Dawson Carty stopped 33 of 35 shots in the Ranger net. Tyler Parsons stopped all 18 shots he faced while Mario Culina allowed four goals on 39 shots. London outshot Windsor 19-3 in the second period. Max Jones (1g 2a), Cliff Pu (1g 1a), Janne Kuokkanen and Victor Mete scored for London, JJ Piccinich had a pair of assists. The Generals outshot the Petes 44-25 en route to the victory. Domenic Commisso (1g 1a), Riley Stillman (1g 1a), Anthony Cirelli (1g 1a) and Kenny Huether (2g) scored for Oshawa. CJ Clarke and Steven Lorentz found the back of the net for Peterborough. Brett Hargrave and Brett McKenzie scored third period goals as the Battalion came from behind to beat the 67’s. Patrick White scored Ottawa’s goal in the first period. Brent Moran stopped 34 of 35 shots for the victory, while Leo Lazarev made 29 of 31 saves in the loss. Alex DeBrincat (2g 2a), Kyle Petit (2g) and Taylor Raddysh (4a) had big offensive nights for Erie. Troy Timpano stopped 19 of 20 shots to win his 4th game to start the season. Tyler Parsons was pulled after allowing five goals on 23 shots, Tyler Johnson turned aside 10 of 12 in relief. Trailing 2-0 through 20 minutes, the Colts scored three second period goals and added two more in the third. Anthony Stefano (2g), Lucas Chiodo (1g 1a), Adrian Carbonara and Cordell James (2a) had big nights for Barrie. Ty Dellandrea (2g 1a) and Nicholas Caamano scored for Flint. Kaden Fuclher stopped 35 of 37 shots, including all 21 he faced in the third period, good for first star honours. Matthew Strome (1g 1a), Will Bitten, Michael Cramarossa and MacKenzie Entwistle scored for Hamilton. Michael Pezzetta and Dmitry Sokoloc scored for Sudbury, Sokolov’s scored five goals in his last three games. Mitchell Vande Sompel (1g 1a) and Domenic Commisso scored for Oshawa, while Matthew Philip scored a power play goal for Niagara. Kyle Keyser made 28 of 29 saves for Oshawa, while Stephen Dhillon stopped 30 of 32 in the loss. Owen Tippett scored a pair of goals and Nathan Bastian netted the overtime winner for Mississauga. Brady Gilmour and Damien Giroux (1st OHL goal) scored for Saginaw. MAtthew Mancina left the game after allowing a goal on 11 shots, Jacob Ingham came in to record the win, stopped 23 of 24 shots. Evan Cormier stopped 39 of 42 and was the game’s second star. Adam Mascherin (1g 2a) and Mason Kohn (1g 1a) scored in the game’s early minutes to give the Rangers an early two goal lead. 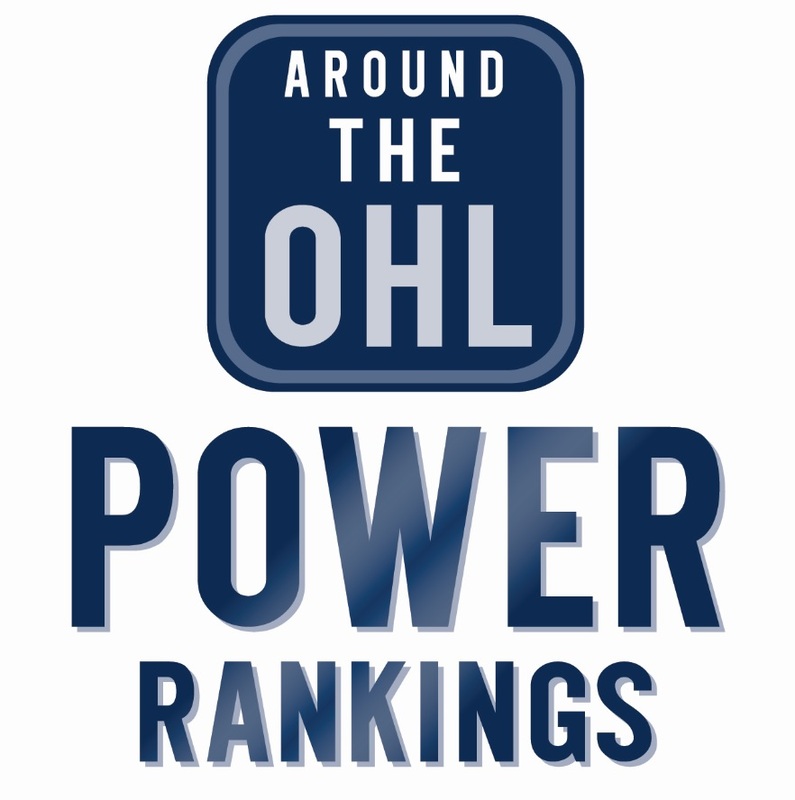 Owen Sound responded in a big way with four straight goals by Kevin Hancock, Maksim Sushko and a pair from Petrus Palmu before Kitchener responded in the third period. Hancock scored his second of the game into the empty net to secure the Attack victory. Owen Sound out shot Kitchener 56-24, first year goalie Chris McGonigle made 52 saves in the Ranger net. Mason Kohn, Darby Llewellyn and Adam Mascherin (1g 2a) scored for Kitchener, while Isaac Ratcliffe and Ryan Merkley (1g 1a) tallied for Guelph. Dawson Carty made 25 saves to record the win. The Rangers went 2/6 with the man advantage, Guelph went 1/5. Jeremy Helvig stopped all 17 shots he faced, while Brent Moran turned aside 28 of 29. Sam Harding’s power play goal in the second period was the eventual game winner. The Battalion only had two shots in the first period, and four in the third. Zachary Senyshyn, Boris Katchouk, Tim Gettinger and Hayden Verbeek scored for the ‘Hounds. Senyshyn has four goals in his last two games. Ottawa’s only goal was scored by Patrick White, his third consecutive game with a goal. Scott Smith made 54 saves for the Petes, as they managed to win despite being out shot 56-21. Logan DeNoble (2g 1a), Jonathan Ang (1g 1a) and Matthew Timms (2a) had multi point nights in the victory. Tyler MacArthur and Petrus Palmu scored for Owen Sound. The Attack registered 50+ shots for the second straight game, and third time this season. Shane Bulitka (1st OHL goal), Darian Pilon and Chandler Yakimowicz (2g) scored for Sudbuyr, while Macauley Carson had three assists, and David Levin has a pair. Comenic Commisso, Mitchell Vande Sompel and Anthony Cirelli (1g 2a) scored for Oshawa. Jakr McGrath stopped 33 of 36 to improve to 3-1-1-0.